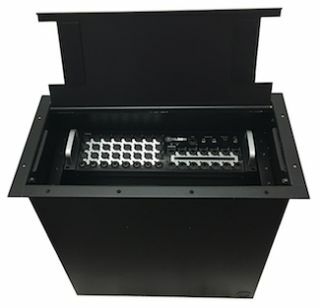 The What: ACE Backstage will show its new and improved RackWell Stage Pocket floor box at InfoComm 2016.The What Else: Larger than a typical stage pocket, this floor box is used in a permanent installation to vertically rack mount digital mixers, personal monitor input modules, patch bays, or other equipment. Power, router, and digital connections are made through provided knockouts in the pocket body, located under the raised stage floor. On-stage connections located on the equipment face are accessed under the RackWell lid, allowing cables to egress onto the stage in an orderly fashion through hinged cable exits. The #125 RackWell pocket body is newly fitted with two access panels located on opposing short sides for equipment ventilation through-put. A redesigned rack rail bracket system includes a protective neoprene dust cover to protect equipment and connectivity when in use or not. The Bottom Line: This specialty Stage Pocket can house up to five rack spaces of equipment for on-stage accessibility, eliminating long cable runs across the stage floor from an off stage patch panel.